VANCOUVER—After a 15-month hunt for a saboteur who has blown up six natural gas installations in northern Canada, police, looking increasingly desperate, arrested an outspoken oil industry critic and then set him free a day later without pressing charges. Wiebo Ludwig, an evangelical preacher jailed in 2000 for a series of attacks on the oil industry in Alberta, was arrested on January 8 and charged with extortion in connection with recent sabotage. After 24 hours in jail, including a 10-hour interrogation by a top police officer, Ludwig was released without charge. He did not return calls requesting comment. The catch and release of the high-profile activist and convicted saboteur adds another twist to a bizarre saga, which began October 12, 2008, with the bombing of a pipeline operated by EnCana, North America's largest natural gas company. At a press conference last July, police labeled the attacks "eco-terrorism" after the Dawson Creek Daily News received a handwritten letter, allegedly from the bomber, demanding that EnCana cease operations in area. "Return the land to what it was before you came every last bit of it... before things get a lot worse for you and your terrorist pals in the oil and gas business," read the letter, which was posted on the website of the Integrated National Security Enforcement Team tasked with investigating the sabotage. "We are confident after reviewing all of the information that is in our possession that we arrested the right person, for the right reasons and at the right time," Inspector Tim Shields told reporters on Janury 12, after Ludwig was released without charge and as more than 100 officers continued to search for evidence on the Ludwig family's sprawling farm. "That police would make an announcement like that in the face of the Crown [prosecutor] saying there isn't enough evidence to go to trial is troubling," said David Eby, a lawyer with the British Columbia Civil Liberties Association. "It is challenging when the police make an announcement of guilt or innocence before someone has been tried and convicted, especially in an issue like this when the community is sensitive and has spoken out against policing tactics," said Eby. Police are treating people in northern British Columbia "like they're Taliban suspects," according to veteran environment reporter Andrew Nikiforuk. Police have demanded DNA from residents under Canada's counter-terrorism act, barged into homes, interrogated husbands and wives in separate rooms and, in a crowded restaurant, accused a local businessperson of being the bomber. The BC Civil Liberties Association has received several complaints about aggressive policing tactics, said Eby. Throughout the investigation police, company officials and local politicians have claimed their top priority is the safety of local residents, which the bomber is jeopardizing. Tim Ewert, an organic farmer living near bombed pipelines, doesn't believe those claims in light of recent events. 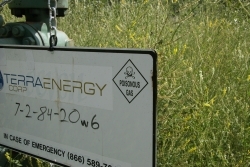 "On November 22 we smelled gas on our property. EnCana's devices to pick up the leak didn't work and around 15 families had to self-evacuate the area," Ewert said. 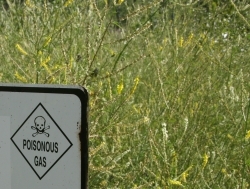 Sour gas, or hydrogen sulfide, is extremely deadly—concentrations of 500 parts per million can be fatal. The November 22 leak is not linked to sabotage. "This leak probably released thousands of times more gas than what has been released by the bombings," said Ewert, adding that police and politicians are not speaking out against the incident, even though it was potentially more dangerous than so-called acts of terrorism. In statements to the media, EnCana denied that its safety mechanisms failed. Paul Joosse, a sociologist at the University of Alberta who studies radical environmental movements, thinks the nature of sour gas has exacerbated conflicts between farmers and industry in the region. "It [sour gas infrastructure] is being put where people live and where children go to school; that really raises the stakes," said Joosse. The Oil and Gas Commission (OGC), the provincial body tasked with regulating the industry, promised to release a report on the leak on January 11 with a public meeting scheduled for January 13. The report was not released and the commission cancelled the meeting, citing the ongoing police investigation of Wiebo Ludwig. Local residents speculate that the OGC, EnCana and the police are working in cahoots to stall the release of a report which could raise unwanted questions about the industry's safety practices and the nature of gas extraction in the region as a whole. "In many cases people feel that they haven't been given a proper say in how things develop and they feel—rightly—that they are stakeholders who should have a say," said Joosse. Tim Ewert says his neighbours are equally worried about recent sour gas leaks but are afraid to speak out, fearing police harassment. When asked why the authorities decided to arrest and then release Ludwig at this particular time, Joosse said, "It looks like police are going and shaking different trees," adding that police "may have decided this was the last chance before the Olympics to have so many officers available [to investigate the bombings]." The Vancouver Olympics, requisitioning some 7,000 police, 4,500 troops and 5,000 private security guards under a security budget in excess of $900 million, begin February 12. "From their perspective, it would be really great to have a charge and an arrest prior to the Games," said Joosse. Today, that hope seems unlikely. Chris Arsenault is a graduate student writing a history of sabotage and the oil patch. This article was originally published by Inter Press Service.